Back in November, we launched the Rowse Product Search & Quote Tool, here on Rowse. In that time we have seen over 30,000 searches performed, from Entrelec terminals to Ansell lights, we have helped customers all over the world find the parts they needed. 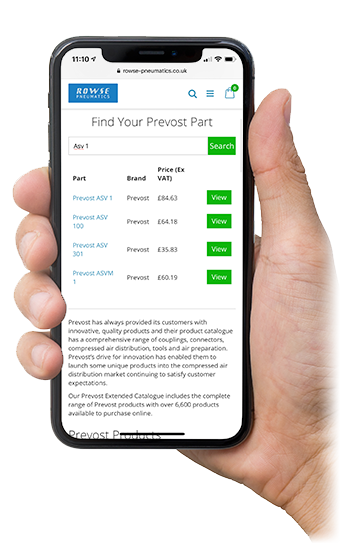 With the success of the Rowse Product Search & Quote Tool, we are proud to announce the launch of the Rowse Extended Catalogue, the extended catalogue is available on Rowse Pneumatics and Rowse Automation currently. The Extended Catalogue allows you to quickly find parts and either get a quote or buy online. Currently, we are launching with one brand on each site, Entrelec on Rowse Automation and Prevost on Rowse Pneumatics. We are going to be adding many more manufacturers to the tool over the next few months. How Does the Extended Catalogue Work? The Extended Catalogue is a straightforward tool. Just search by part number, and you will find the parts you need. From there you can quickly view, add to quote or buy now, right on the website. It's that simple. If you cannot find the part you require, our helpful team are on-hand to help.